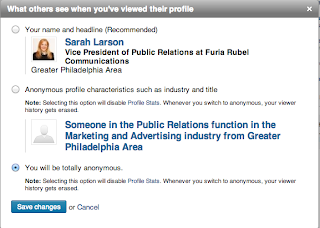 The PR Lawyer: To Be Anonymous or To Not Be Anonymous on LinkedIn: What are the reasons? 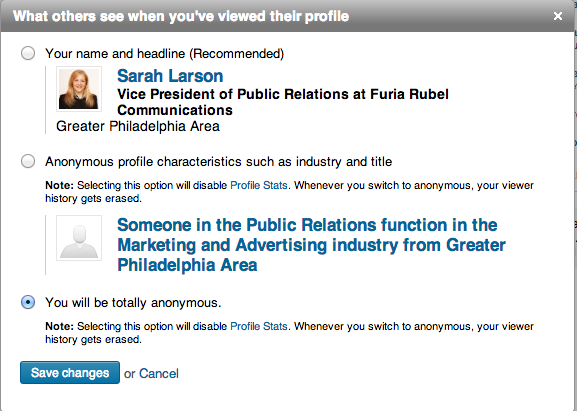 To Be Anonymous or To Not Be Anonymous on LinkedIn: What are the reasons? Have you ever wondered how you can view someone’s profile on LinkedIn without them knowing you’ve been rooting around their information? I recently did and after a bit of digging on the Internet, I found out how it can be done and learned a few things in the process. I often check to see who has been looking at my profile, simply out of curiosity. Sometimes, instead of a person’s name and title, I see ‘LinkedIn Member’ or ‘Someone from XYZCorp’ viewed your profile. Wondering how that could be done, I did a Google search for how to be anonymous on LinkedIn and viola! Found my answer. I followed the directions by Emily Co in her post on PopSugar.com and I was suddenly invisible on the professional social media site. So, off I went to lurk for a bit. Why would you want to be anonymous on a social media site set up for professionals to network with each other in an open forum? For several reasons. 1. It’s great for researching everything from job applicants to would-be clients. Lawyers, managers, physicians, marketers, job-seekers, hiring managers, college recruiters - you name the profession and someone may have a reason to be searching for information on LinkedIn without their targets being able to identify them. LinkedIn makes it easy to review someone’s professional affiliations and check directly on their employment experience. 2. It’s also useful for checking out the competition. See what your competitors’ companies and organizations are doing and to whom they may be connected. See what thought leadership articles they’re sharing and what kind of engagement their posts are eliciting. 3. Filling in details on the unfamiliar name left in a voice mail. If you can spell it, you can search for the person’s name to see if you know them and have an idea who they may be before you call them back. LinkedIn’s privacy settings offer a range of options for displaying your identity. You can set up your profile for full disclosure, showing your name, the company you work for or the first line of your profile. You also can opt to share less information, displaying only your business type and title. Or you can go full cloak-and-dagger by hiding your identity completely. But beware; this article by Andy Foote, a LinkedIn management consultant and social business strategist, outlines some pitfalls when you operate on the site unidentified. A blog post from Matt Hubbard at FullContact.com discusses the ins and outs of privacy settings on social media and LinkedIn in particular. Hubbard’s article discusses a way to override the inability to see who has been looking at your own profile if you have a smart phone, but LinkedIn appears to have disabled that loophole on its mobile app. It seems it is mostly frowned upon to be anonymous on LinkedIn, but anonymity can be used judiciously when needed; I won’t hesitate to poke around quietly on occasion. What about you?